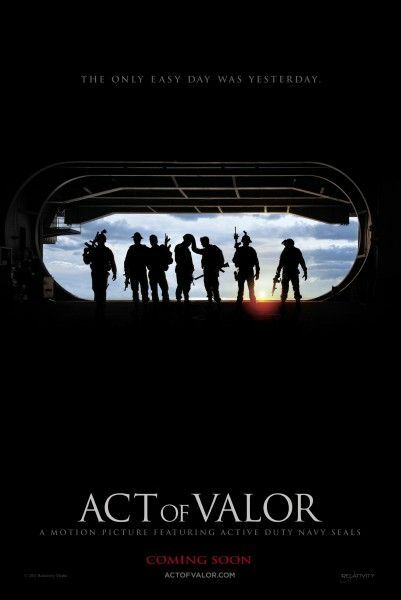 The action thriller Act of Valor (opening in theaters on February 24th) tells a fictionalized account of real-life U.S. Navy SEAL operations with a group of heroic, active-duty U.S. Navy SEALs in the lead roles. When a mission to rescue a kidnapped CIA operative (played by Roselyn Sanchez) unexpectedly uncovers a chilling terrorist plot on America, a team of the most elite, highly-trained warriors is dispatched on a top-secret operation, the result is a gripping story that takes audiences on an adrenaline-fueled, edge-of-the-seat journey through a dangerous and unpredictable world. At the film’s press day, Collider spoke to directors Mike “Mouse” McCoy and Scott Waugh, in both a roundtable and a 2-on-1 interview, about what led them to this unusual blend of filmmaking, how their background as stuntmen enabled them to do what was necessary to make the film, adapting the story to suit the real SEALs who would be taking on these roles, what surprised them the most about the men that they worked with, making sure that they didn’t reveal how any of the tactics are actually done, why this movie also appeals to women, and where they go from here. Check out what they had to say after the jump. How did this film come about for you? MIKE “MOUSE” McCOY: We set out to make an action narrative, but it started with an exploratory phase of, “What would it look like to work together with Navy Special Warfare and the SEALs, in a way that’s not impactful on their training cycles or their operational deployments and doesn’t tax their resources, but yet communications all the values we want to communicate in the film?” The most important thing was to communicate the brotherhood of the men and the sacrifice that they make. Do you feel like you could have ever been able to approach something like this, if you hadn’t had a background as stuntmen? SCOTT WAUGH: I think you nailed it. That was one of the reasons they trusted Mouse and I so much. It was funny because they definitely did their background checks on Mouse and I. They knew all about us, by the time we went down there. They started naming off all these people that we knew and I was like, “Wow!” Because of that, they were able to trust us to be in situations that no other filmmakers would probably be allowed in. They knew we would listen to them, and that we would be physically capable of it. McCOY: And that we would be safe, as well, because this wasn’t a cowboy venture. I think there was just a commonality of cultures with us and them that really allowed the dialogue to open up. Once it opened up and we started to really learn about these acts of valor and the things that have happened to the men on the battlefield, in the last 10 years, we felt really compelled to communicate that in an authentic and genuine way. Once you decided to have the real SEALs in the film, were there ways that you adapted the story to suit them? WAUGH: We formed the story around two big set pieces. There were the five acts of valor that they told us about. There were multiple acts of valor, but we found five of them that Mouse and I really liked because they were very powerful stories that we wanted to weave a fictitious storyline through. That’s when we brought in (screenwriter) Kurt Johnstad to help us write an enemy threat line through these five acts of valor. But, the thing that was really interesting was that, once the eight guys we approached said no, and then finally said yes, Kurt wrote the screenplay around them. They were themselves. They were never playing characters. He got to meet all the guys and understand them. McCOY: Approaching it, all the operational planning was done by the SEALs, but then, on a day-to-day basis, scene by scene, they would really rewrite the dialogue, as it would be in that moment. So, it became very comfortable for them. It became a natural thing. They were saying what they would say, in their own voice. They weren’t playing characters, they were just being themselves. Since it took some convincing to get the SEALs to be in the film, were you ever worried that they just wouldn’t do it? In the process of making this film, there was suddenly a huge light shone on the SEALs for their successful mission in taking out Osama Bin Laden. Do you think that new attention will help get people interested in this film? McCOY: The film was completely finished before the Bin Laden incident happened. WAUGH: Yeah, we had been making the film for four years. WAUGH: I think the year is very representative of the feature. Within this last year, the teams have had incredible victories and the worst of disasters that happened with the helicopter crash. For the four years that Mouse and I were making the film, we’d always said, “We don’t have stars for our movie, we have heroes.” Sometimes events like that actually raise people’s awareness of that and also makes them go, “They don’t have stars in that movie, they have heroes.” We’ve been saying that very loud, but they didn’t hear us before. Were there things that you learned that surprised you, in working with and getting to know these guys? McCOY: Yeah, they were some of the most humble men we’ve ever met. They’ve been extremely misrepresented in popular culture, especially in film. The guys aren’t some crazy Rambo/Terminator dudes. They’re actually really genuine, down-to-earth, good guys who are fantastic family men and fathers. The devotion to their family and their kids, and their ability to go do their job but still be great dads, is what stood out for us. WAUGH: We truly didn’t know much about the community before we started to take a look at their world. All I knew was Charlie Sheen in that Navy Seals movie, and I was pretty sure that probably wasn’t accurate. So then, when we got to meet the guys, they were the antithesis of everything they’ve been portrayed as. McCOY: They’re definitely some of the most intelligent and intellectual men you’ve ever met. They’re maybe even smarter than they are tough, if that’s possible. WAUGH: It’s almost like they’re trying to be the perfect man because they’re constantly educating themselves. We stop educating ourselves. They just keep pushing themselves to become better people. It’s great. Was it challenging to show what these guys do while always keeping in mind that there were certain things that you couldn’t show or reveal? McCOY: Well, they did all the operational planning, so we’re showing capabilities, but we’re not showing how you actually do tactics. We had complete creative control on the story, which was important, but they had a scrub on the movie for what’s called T.T.P. – technique, tactic and procedure. So, they scrubbed the entire movie to make sure that we weren’t giving away anything classified to the enemy. WAUGH: We didn’t want to do that, either. We’re proud Americans and didn’t want to give our enemy the upper-hand. Having them on set kept us in check. They’re very aware of what the enemy is not aware of. Was there anything that you were given access to that surprised you? McCOY: Well, it’s the first time the world is ever going to see a nuclear submarine in a movie, for real. I can guarantee that. It’s the first time they’ve ever really let it be photographed. So, that was a big deal, that we were able to showcase the submarine. WAUGH: It was very beyond James Bond. From a technical standpoint, how much of a challenge was it to be working with such complex situation and the addition of live fire? WAUGH: That’s why it took four years. It was very complex. McCOY: It was a lot of fun. To be challenged that much, mentally and physically, and to really challenge our backgrounds as stuntmen and professional athletes, and to rise to the occasion and roll in real time on these operations with some of the most talented men in the world, was just really rewarded and pretty rad, if I can use that term. Being in the middle of a live fire exercise or gunfight, and then putting the audience in the middle of that situation, was really important for us. We wanted the audience to really feel what it’s like to be in their boots and see the world the way they do. So, it was cool, but extremely complex. It was a very disciplined working environment. We weren’t just winging it out there. Everything was really thought out and blocked out. WAUGH: The interesting thing about the project was that it did go on longer than we anticipated just because of asset availability and the guys on deployments. Dave, our lead in the film, just got back last week from being in Afghanistan for 11 months. These guys are constantly being deployed. Every Christmas, somebody would ask me, “So, what are you doing now?,” and I’d say, “I’m still on that Act of Valor movie.” It went on for four years. We were working on it so long, I got engaged, married and had to kids before we were done. McCOY: The hardest thing about the film was watching your friends go back down range. Almost every guy that’s in the film re-deployed on a combat deployment during the making of this movie. At that point, you don’t care about the movie anymore. You just want your friend to come home. For us, that was when we really started to understand what it was like for the friends and family to watch the guys go. How did you choose the actors you surrounded the SEALs with? WAUGH: When we were talking about casting, once we realized that we were going to use the real guys, we had to decide who we were going to surround them with. We didn’t want to alter the authenticity of the movie by having them go in and rescue Michelle Pfeiffer or Dennis Hopper, before he passed away. That would really just wreck the whole experience. So, we wanted to find the most talented actors we could find that weren’t that recognizable. Roselyn [Sanchez] was the furthest we went with being facially recognized by people. Jason Cottle is a Broadway actor. He’s a theater actor that you would never know about until this film. Nestor [Serrano] is definitely recognizable, but he doesn’t last too long, so we didn’t think it would alter it too much. McCOY: For Roselyn’s character, it had to be somebody who you would believe was indigenous to the area. Her role as a CIA operative working under the cover of Doctors Without Borders was indigenous to the area. She had the ability to totally blend in, being fluent in Spanish and English. We took our chance on somebody as well known as Roselyn not being a distraction from the film and that authentic mission. Did you ever worry that you were making the film too brutal? WAUGH: We asked a lot of the guys about the things that they’ve seen and [what Roselyn’s character goes through] is probably the most tame thing that they would have seen. What they’ve seen is so far beyond our comprehension of brutality. These people are bad people and they do really horrific things. What we did with Roselyn, as horrific as it is, it’s elementary compared to the things they’re doing to hostages. McCOY: It’s an important point to make that this film is a total indie film. That’s getting lost because it’s getting a big release, but this film was as indie as it gets, so we could explore that potential without having any oversight. We really set out to make a new kind of action film that was grounded in reality and grounded in physics. There’s no CGI in the movie. It’s all in-camera and for real, and we’re proud of that. We didn’t get forced down that road by a studio, so we were able to stick to our guns throughout the entire process. That was rewarding for us. Obviously this is a guy’s movie, but what would you say to women who are wondering if this movie would appeal to them? WAUGH: When we first set off on this film, Mouse and I both looked at ourselves and said, “We need to make this movie for women.” That was a primary focus of ours. McCOY: And that was really natural because, once you start to understand the depths of sacrifice that the women have gone through, it really hits you between the eyes. Our lead in the film, Chief Dave, just got back from an 11-month deployment in Afghanistan, and his wife was home-schooling five kids for 11 months, while he was gone. These women are really strong and really courageous, and they hold their families together. They just start taking care of business. We have more respect for them than anything. WAUGH: When women watch this film, they get to personally see and identify with the sacrifices of the wives, but they also get to see these incredible men. It’s a win-win for a woman, with this film. You get to laugh, cry and also get to stare with your jaw dropped down, at how great these men are. Where do you guys go from here? How do you decide what you’re going to do next? McCOY: Well, Bandito Brothers is all about heartfelt stories immersed in great action. So, we’d like to head down that same path. Right now, we’re still in the moment on this project. It’s one of those ones that we don’t want to end. It’s been too rewarding. WAUGH: It’s been a great process. We feel very blessed, on this film. Is it difficult to have to go back to doing action scenes with actors again and getting them to do their stunts? McCOY: We respect actors. They’re great. But, these guys were the opposite of that primadonna character. We were shooting the scenes in the swamp and the A.D. said, “Okay, get make-up in here to spray them down with water to make them look like they’re getting out of the swamp,” because there were alligators and snakes and every bad thing, in that swamp. The guys just jumped back in the swamp and said, “Okay, we’re ready to go. We’re good.” It was great.